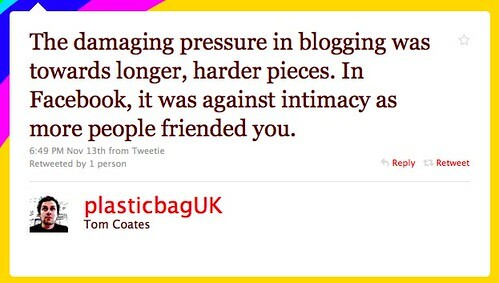 Something Tom Coates entweetened about blogging the other day has stuck with me. The urge to write longer things makes blogging more considered and therefore harder. Some would say that's a good thing. Filtering out the chaff. I'm not sure. For me, blogging is about momentum and 'more considered' makes momentum harder. Interesting things emerged from the less filtered rush of words. I enjoyed blogging because there was room for fragments of thought as well as something polished and finalised. Or something. Anyway. Back to more fragments on here from me.